Sometimes a project happens when circumstances collide in just the right way. Nosing around for fabric online, I came across the delightful Lakehouse Tea Labels fabric. Lovely, but I couldn’t think of anything I’d use it for. I also stumbled across Ayumi’s cute lunch bag tutorial. I use a backpack for work, so I don’t need a lunch bag, so I filed it away for ‘maybe for someone else’. A few months ago, I got some fancy French macarons as a treat for my mum. She loved them, but she also loved the sturdy paper carrier bag they came in – she’s been using it as a lunch bag ever since. Alas, it’s made from paper, and when I last visited she told me it was falling apart. … aha! One plus one plus one = the cutest thing I have ever made! Now, the path to cuteness wasn’t smooth. Ayumi suggests a firm interfacing, so I duly ordered some firm Vilene. Firm? You could build a house with this stuff! I was dubious when I ironed it on, but carried on regardless. When I had to really struggle to turn the bag right-side out, I knew it wouldn’t work out. I set it aside, and made a new outer for my bag (it turns out that ‘medium’ Vilene was just fine). I kept the firm interfacing for the handles (but just used a single layer). I didn’t want to waste that pretty fabric, though, so I came back to my rigid ‘bag’. I made a second liner to go inside, and some binding for the top, and voila! A useful basket! It will likely end up in the kitchen, holding spare tea towels. Ayumi’s lunch bag tutorial (for the bag) and improvisation (for the basket). Lakehouse Dry Goods Penelope Tea Labels in Tea for the outer; a Thimbleberries Subtle Solid in a mustardy gold crosshatch for the lining. I learned that making a bag isn’t difficult or complicated at all! I whipped the bag up in about an hour, ignoring the diversion with the interfacing. The basket took a similar amount of time. The bag, in particular, has a very high cute-to-effort ratio. I’ll be making this again – I might make one for me with the drawstring top for a knitting bag. And I learned to follow my first instinct about interfacing. If I struggle to fold it in half when it’s fused to fabric, it’s too firm for a bag! Let’s start with the WIPs (it is Wednesday, after all). Colourful Lemonade. It’s been basted and ready to quilt for a few weeks now, I was just waiting for the right colour thread to arrive. I also want to experiment with some of the pretty stitches on my machine for this one, so I need to do some test drives. The thread is here now, though, so no more excuses! Placemats. 4 are cut and pieced. I might make another 2 while I’m at it, because they took so little time. I’ve cut the insul-bright, but need to cut regular wadding and backing fabric for them. I also want to make a table runner to go with. Hmm. Need more insul-bright. My next quilt. I want to make a quilt for the spare bed. However, my mind keeps going back to the idea of a fishy quilt with my leftover ‘watery’ fabric. Ah, temptation. And FOs galore! I’ll do some individual posts for these later, but I have a bag, an accidental basket, a fitted sheet and some pillowcases. All done since Friday. Not too shabby, eh? Linking up with WIP Wednesday over at Freshly Pieced, hosted by Bethany this week. Yes, that’s right. Wednesday’s WIP is Friday’s finish. Tiny quilts are clearly the way of the future! A variation on Hexagon Park by Lynne from Lily’s Quilts. I reduced the size of the hexies (I started with charm squares, not a layer cake), and I changed the size of the strips between them too. I also made fewer blocks to finish up with a quilt approximately 20″ square, which will be headed to my local branch of Project Linus for a preemie baby. Hexies are Pezzy Print, surrounded by Moda Bella Snow. The binding is from Happy by Me and My Sister from Moda (22315-14), and the backing is a ‘waves’ print from Fabric Freedom. Machine quilted down the zig-zags between columns of hexies in a thread that toned with the background fabric. I learned a lot with this one, too. Spray starch helped so much when cutting those bias edges. I don’t think I got much stretching at all – I think I’ve conquered by fear of angles! Not all of my points match, but they’re a vast improvement on my first quilt. Pinning and accurate cutting helped a lot (imagine that!). I squared up my blocks at a couple of points during the construction process, which also made a big difference for how accurately they came together at the end. I mostly used this technique for machine sewing the binding. I was a little apprehensive, but it worked a treat – you really can feel the back of the binding from the front. It also gave me lots of practice at stitching in the ditch, which I’m getting better at. I only went up onto the binding in 2 or 3 places, which I’ll count as a win! Next time, I just need to adjust the width of the first binding seam (attaching the binding to the front), because it’s a little wider at the back than I’d prefer. It was really nice to see how much I’ve learned so far, compared to my first quilt. This is only my second complete quilt (the third top I’ve pieced). And just like last time, the machine quilting was so much fun! I have the thread to quilt Quilt 2 now, but first I need to whip up a little bag for a birthday surprise. I’ve got the pieces cut, I just need to sew it together (my first adventure with interfacing!). And finally, but certainly not least, I got lovely fabric in the mail today! I won a giveaway at Very Kerry Berry this week, and got these gorgeous Art Gallery FQs in the mail today. The pale one on top has got the better of my camera, I think – it’s very pretty in person. I think I might need a pretty lunch bag of my own, too! Linking up at Confessions of a Fabric Addict for my Whoop Whoop!, TGIFF at Missy Mac Creations this week, and Richard’s LAFF. Also linking up with Quilts are For Giving’s Tuesday linky party, and 100 Quilts for Kids. It’s funny, but a 20″ square quilt goes so much quicker than a ‘full size’ baby one. Imagine that! I’ve been making a modified Hexagon Park, because I wanted to play around with machine-pieced hexagons. It’s my first time playing with angles – spray starch is my friend! I have a complete top! And some binding cut, joined and pressed, ready to go! The quilt is basted and I bet I can get it done this week. It will be my first time quilting on this sewing machine, so I’ll keep it simple and do echo-y zig-zags between the hexagons. So that’s my priority WIP for the week. Other WIPs include turning a flat sheet into a fitted one, and waiting for the thread to arrive so I can quilt my Colourful Lemonade top (it’s basted and ready to go). If that takes a while to show up, I might just start cutting out fabric for placemats. And I woke up this morning to some great news. I won a giveaway! The lovely Very Kerry Berry was recently giving away some Art Gallery FQs. They’re gorgeous and it totally made my day! Linking up with WIP Wednesday over at Freshly Pieced, guest-hosted by Katy this week. That’s right, I finally finished my cutting mat bag. For a ‘simple’ project, this certainly took a lot of time and caused several headaches. Note to self: next time I think “That’s easy, I can wing that!”, take it as a warning sign. Here’s the outside. I love that swirly tree fabric (Ikea, home dec weight). I made two sides (you can see them in this post), each a sandwich of swirly trees, a cheap fleece blanket for ‘wadding’ and a leaf print for the inside. I sort of bound them together to cover the raw edges and create a gusset for extra space (I didn’t cut my sides big enough). I ‘quilted’ the outside fabric to the fleece following the swirly tree lines. It’s my favourite bit of the whole project 😀 I was worried I’d mess it up, but actually, this went perfectly first time (unlike all the ‘simple’ things like cutting bits the right size!). There are pockets on the inside to hold rulers (you can see them better in this post), and the mat slips in between. The final stages of this bag were causing a bit of a blockage in my sewing mojo. It just wasn’t going right, but I didn’t want to start a new project because I didn’t want to change the machine settings (lazy, right?). Now it’s done, I feel so much better and want to sew All The Things! Linking up with Confessions of a Fabric Addict for a Whoop Whoop!, and TGIFF over at Stop That Owl this week. Quilt for our super-king bed. The quilt that got me into this in the first place! I decided to start with smaller projects for practise. Placemats. Our existing ones are a bit very grotty, and I’m afraid they’ll fall apart in the wash. I took advantage of Abakhan‘s recent sale and scored some fabric on clearance to make some new mats (Moda at 70% + off? Hell yeah!). Hot pads. Our existing ones are as useful as a chocolate teapot. I’ll make some to match the placemats. A table runner to match the new mats. Just because I want to experiment with Dresden wedges. But first, a modifed Hexagon Park in Pezzy Print. I’m making this in a preemie size for Project Linus to practise machine-sewing hexagons. I finally got started on the piecing today and it felt so nice to make progress with something! Linking up with WIP Wednesday over at Freshly Pieced, guest-hosted by The Busy Bean this week. I had such plans for this week, I did. There’s a quilt all basted and ready for quilting, now my walking foot has arrived. There’s another quilt top I want to piece, all cut out and waiting for me. There’s my cutting mat bag, with not a whole lot more to be done on it. And what did I do? Very little on that list. We’ve had some domestic upheaval for the last few months and this week, there was suddenly a glimmer of light at the end of the tunnel. And that’s when I realised just how exhausted I was. So most of my spare (sewing) time this week has been taken up by reading and relaxing. I’ve got through almost all of my stash of Little House books, but sewed only a little. I think I decided I was my most important WIP this week. I did make a little progress with my cutting mat bag. I ‘quilted’ the outsides (my batting is a cheap Ikea fleece blanket!). I attached pockets, buttons and button loops. I even sewed it together with binding around the edges. There’s no picture of that, though, because I buggered it up and have spent the afternoon ripping it. I’m visiting family next week, which means the bag will just have to wait until next weekend to be finished, and my modifed Hexagon Park pieces will stay in pieces for now. But next weekend, I’ll get there! What is a no-reply blogger? A no-reply blogger is someone who doesn’t leave an email address in a comment. Not always a big deal, as long as you know that’s what’s happening. I didn’t realise I was no-reply, and was merrily leaving comments on blogs and giveaways without realising there wasn’t an easy way to get back to me. There’s a great tutorial here from Pleasant Home about fixing the no-reply blogger problem for the Blogger platform. But that’s not the problem I had. You see, I blog at WordPress.com. I was using their OpenID authentication to leave comments at places like Blogger. And it turns out that Blogger doesn’t play nice with OpenID. I assumed that OpenID would leave my email address, as well as my name and blog address. Guess what? It didn’t! 1. Leave an email address in my comments on Blogger. This relies on me remembering to do that, so not an optimal solution. 2. Make a Blogger account. This is what I ended up doing. You can see how I set my profile up here. I used the instructions from Pleasant Home (linked above) to make sure my email address was visible, and I set up a link to my WordPress.com blog. It’s not the most elegant solution, but it works and it will have to do until Google decide they want to play nicely with the rest of the internet. I hope this helps another OpenID user leaving comments on Blogger blogs. Linking this up with Plum and June’s excellent advice series, Let’s Figure It Out Together! 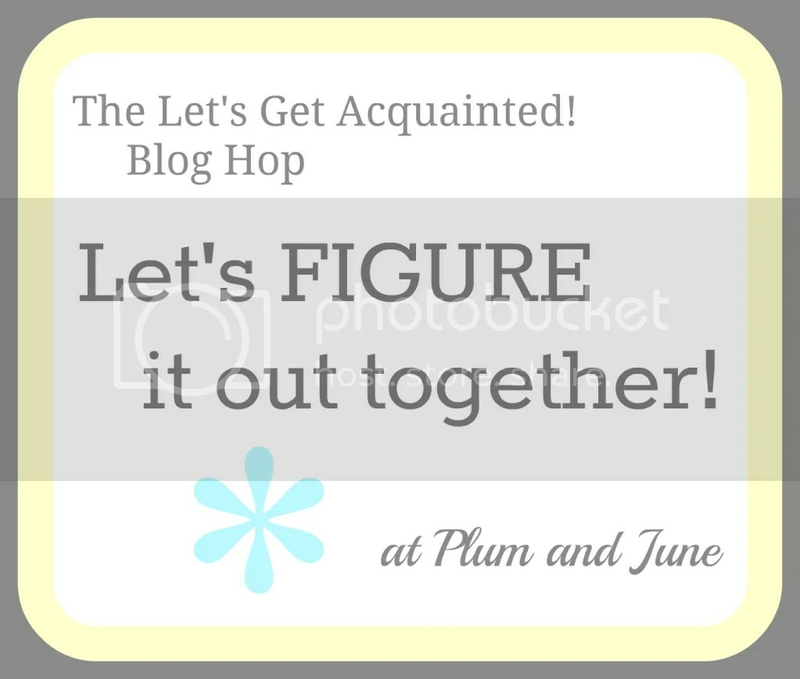 on their Let’s Get Acquainted blog hop. Baby’s first quilt – finished! My first finished quilt! Go me! A variation on a Trip Around the World quilt, made with strips from a Kona Solids Classic jelly roll and Moda Snow. Machine quilted in a square double spiral, using King Tut thread in Cleopatra. Binding: Benartex Scribble Multi. Backing: from the Very Hungry Caterpillar range. The quilt finished at 34″ square. Accurately cut pieces are vital if you want to achieve an accurately pieced result! I pre-washed my jelly roll strips, which left me with frayed edges, which meant my squares are far from square. They also don’t line up – I didn’t know about pinning my seams to help them match up. My borders are wavy, because I measured the edge of the quilt, not the middle. Machine quilting turned out to be much easier than I feared. I attached the binding by machine, too, and that worked out ok. On my old sewing machine, I had no seam guide, so if I was using the walking foot, I couldn’t easily measure the seam allowance properly. On my new machine, I do have a seam guide, so next time I’ll be able to sew an accurate 1/4″ seam and use the walking foot. I love the binding fabric, and the backing is super cute and cheerful, but I wouldn’t use them together again. They’re too busy together. I should probably have used a single-colour stripe for the binding instead. Linking up with Can I Get A Whoop Whoop at Confessions of a Fabric Addict, TGIFF at Quokka Quilts, and Richard’s LAFF!